I got up at five a.m. for the royal wedding. I wanted to see every big and tiny moment. It was more than worth it. I was left with some thoughts. Hands down Doria, the bride's mother, was the classiest and most beautiful person at the wedding after her daughter. She was quietly dignified. Endearingly teary. She let Prince Charles be her partner without timidity or fuss. She looked gorgeous. Kudos to Prince Charles for picking up all the loose threads with ease and charm and for taking care of Doria and Meghan for his boy. Meghan had one expression: a big indefatigable smile that never left her face. She smiled through the small moments and the big moments. Prince William was chatty with his brother and with his father. He is immensely likeable. He did his job without grandstanding. He let his brother wave alone to the crowds when they were walking to the church. It was Harry's day. I don't remember Pippa being so beautiful. Fergie was greeted warmly by her daughter's fiancee but didn't get to sit with her daughters or her ex in the royal section. Why do they humiliate her? Victoria Beckham always looks pissed. Amal and George didn't whisper to each other while they were strolling to the church or when they waited in the pews. They didn't look at each other either. George smiled at the crowd but Amal didn't smile. Serena and Alexis talked and looked at each other and smiled. Oprah didn't get a lot of camera time. She seemed less significant in England than she is in the U.S.
William and Harry talking casually while waiting for the ceremony to begin. Harry tearing up immediately at the altar. Harry looked anxious. He looked like a groom who was worried the bride would be a no-show. 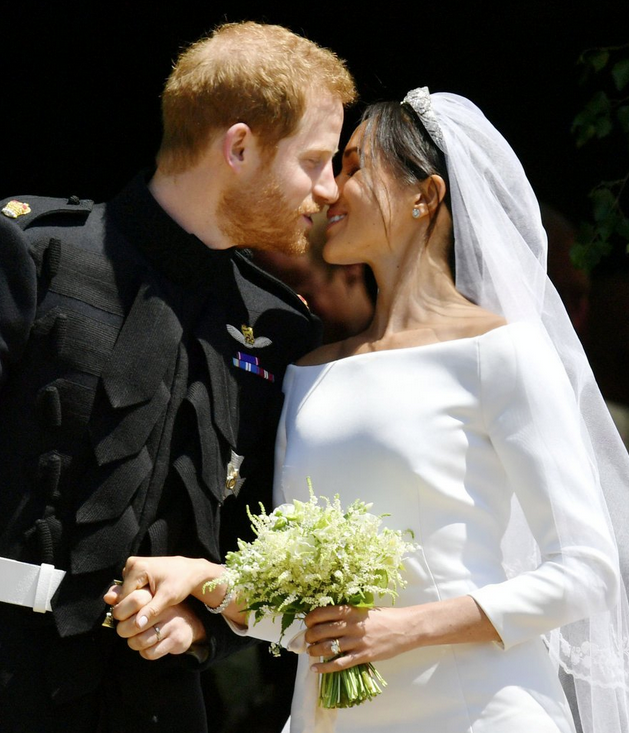 The word besotted was invented for the look on Harry's face when Meghan appeared and when he moved her veil back. Both the Queen and Philip, in their nineties, got out of the car and walked unaided, even up many steps. The phrase noblesse oblige comes to mind. Their stony confusion was priceless when the Gospel Choir began to sing Stand by Me. It made me think of Sister Act and I expected Whoopi Goldberg. James Corden was there with his wife. I wouldn't have been surprised to see him do a car karaoke with Elton John right in the center aisle. That's the kind of wedding it was. The Chicago minister talked a tad too long or maybe his energetic delivery made it seem long. I don't think Meghan knew the words to God Save The Queen. National anthems make everyone appear as they did in first grade. Kate was another non-smiler. I think I saw an eye roll, too. Maybe the post-partum hormones are still kicking in. The kids behaved. The boys in charge of the very long veil did their job. Charlotte did, too. She waved energetically. The cello player was fantastic. I wish he had played earlier in the ceremony. After the pre ceremony wait and the emotional vows and the Chicago minister the guests were both tired and overstimulated. They were anxious for the newlyweds to reappear. Bravo to the cellist though. Only nineteen years old. The best part of the wedding was the crowds. The crowds made a magnificent statement to the joy and fun people crave and will not be denied. This was a once in a century opp to experience a fairytale. Hooray to all those who traveled from all over the world and waited for hours, days, to watch this great rom-com climax. The crowds and their cheering gave the wedding heft and made it work as a historic moment. Johan, I just saw your comment. Thank you. The best part of blogging is hearing from readers. And, yes, I still want to know all about these two crazy kids.